A few years ago I was part of a small group discussion. Around the room were 12 people, all from my church, ranging in age from late 20’s to mid 60’s. Although I had a friendship with every person present, most in the room did not know each other. Because of this, I asked each person to introduce themselves and share how they became a Christian, the common denominator of our lives. Hearing how people come to faith in Christ is always an interesting exercise. As the folks went around the room, a common theme emerged. One came to Christ when her 19-year-old son was killed in an automobile “wreck”. She went on to tell us how there are no “accidents” in God’s world. One became a Christian via the example & death of his Grandmother. One believed after watching her uncle die of cancer. Another came to faith after losing his family because of his successful business and long hours away from home. Another came to Christ because of a divorce. A broken engagement devastated another into the arms of God. As for me, my father’s sudden death (when I was 5) was instrumental in helping me recognize my need for God. As they shared their story, I was amazed at the number of people who came to God because of a tragedy or loss. It reminded me of the famous quote credited to C.S. Lewis, “God whispers in our pleasure but shouts in our pain.” Apparently, we listen more clearly when pain is involved. As I look through the Scriptures, I see a similar pattern. The Apostle Paul came to Christ after being blind for 3 days (Acts 9). King Nebuchadnezzar repented after being humiliated by God in front of his nation (Daniel 3). The thief on the cross gave his life to Christ while he was being executed (Luke 23). The woman at the well came to Christ after her embarrassing lifestyle was revealed (John 4). Even Pharaoh bent his knee to God (although briefly) when he lost his firstborn son (Exodus 11). None of the people listed above would have submitted to God without some sort of painful experience. Do not underestimate the power of pain. Though we would not naturally choose the painful path, oftentimes it is the only way some are aware of God’s presence. The thing we try to avoid the most seems to be the thing God uses most often to draw our attention to Him. Without pain, you would not know you have a splinter that could cause a life-threatening infection. Without pain, you would not be able to tell you were on fire – permanently damaging your skin. Without pain, you would not realize your urgent need to see a doctor. Without pain, you would not realize your current behavior is hurting those around you. Without pain, you would not fully appreciate what it means to feel good. For those who have ever lifted weights, you know what I’m talking about. When weight lifting, it is only when your muscle begins to hurt that you are truly building the muscle. All the work prior to the pain, was simply the precursor to the growth. Once you feel the pain in your muscle, that is when you must continue in order to grow like you desire. 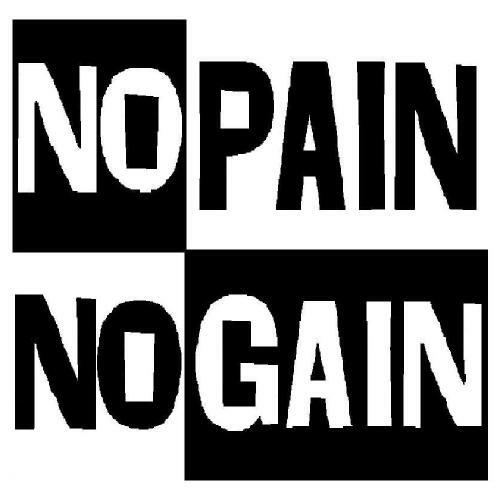 There is a lot of truth to the adage, “No pain, no Gain“. I am not suggesting that we should necessarily aim for pain in our personal lives. I am not in support of joining the local sado-maschist group in your community or look for ways to get hurt. But I am suggesting to view pain from a different perspective, next time it invades your life. I can’t tell you the number of times that I have experienced pain in my life. Sometimes, it seems that pain is the default setting in my life. As I am going through it, I hate every minute of it. I look for ways to end it. I do what I can to minimize it. I desperately want to be on the other side of it. That is human nature. Days, weeks, months or years later – when I reflect on that painful experience, I almost always see good that came out of it. Whether it was a physical pain or even an emotional or relational pain, I am able to see how that particular experience, though painful, helped me grow as a result. Cognitively, I realize pain’s benefit. In spite of that recognition, I still do what I can to avoid it. And that is why God, as a loving Father, continues to allow us to experience it because He knows it is often the ONLY way we’ll grow. Fortunately for us, God isn’t interested in our happiness as much as He is interested in our holiness. He’s cares more about our growth than He does our games. He loves us too much to let us be comfortable and stagnant. His goal is to grow us to maturity, not let us remain in our childish ways. We can cry, complain and stomp our feet at Him, it doesn’t matter. He knows how to grow us and nothing will keep Him from it, even our tears. Speaking of tears, even God’s own son, asked for another option besides the excruciatingly painful cross. Jesus’ wasn’t as concerned about the physical pain of crucifixion as He was about the relational pain of separation. God called Him to die for His people and the only way it would “work” was through the painful experience of the cross. For the first time ever, the Son would be separated from the Father. They had only ever enjoyed blissful communion with each other and now Jesus was about to experience blistering condemnation. It would literally kill Him. The cross was the only way for a righteous Judge to pardon His people’s crimes. The death of a sinless Savior would be the only payment accepted. Jesus could cry all He wanted, pain was inevitable and God Himself would not stop it from coming – even with His Son. Some misinterpret this as proof that God is unloving. If the avoidance of pain was God’s primary goal, then yes, God would be unloving to put His Son through such agony. But if God had a greater goal that could only be accomplished with pain, greater love has never been shown. The pain proves it. What’s your perspective on the pain in your life? Instead of focusing on your painful experience, perhaps God is using it to save/teach many lives through you. Instead of complaining how much something hurts you, recognize that maybe God is trying to teach you obedience. Instead of throwing yourself a pity party, be thankful that He can use such trials to give you a more mature faith. Perhaps you need an injection of gratefulness and the only way to receive it is through the needle of pain. Pain is a part of our lives. For most of us, it is the only way we grow. Remember, no pain, no gain – even spiritually.